ZOM-B FUGITIVE is the latest novel in the Zom-B series, and we're delighted to have Darren Shan stop by to tell us more about it. There’s a scene in Zom-B Fugitive, about halfway through, which provides one of the biggest shocks of the series to date. Originally I’d planned to have it at the end of one of the books, but it worked better here, where nobody was expecting it. It’s one of the most powerful, stomach-dropping scenes in the entire series, and while it was always going to be a powerful moment, I’m especially pleased with how it played out. I think The Stand by Stephen King would be popular with Zom-B fans, as it was a big influence on me. Also, in a very different way, a book called The Turbulent Term Of Tyke Tyler by Gene Kemp, which is very certainly not a horror book, but had a big impact on these books regardless. How long did you work on ZOM-B FUGITIVE? I spend between two and three years on every book that I write. I actually write a first draft very quickly, but I then like to spread out the editing process, with long breaks between each edit. That allows me to go off and work on other books, so that the editorial work doesn’t get stale. What do you hope readers will take away from ZOM-B FUGITIVE? That the world is even more dangerous and twisted than we imagine, and we must be on our toes every step of the way through life. It isn’t easy, so work hard, be prepared for rejection, and make gradual improvement and writing the very best books you can your goal, as opposed to being a bestseller. Some of the best books out there never made it anywhere near a bestseller chart. Know and appreciate the worth of your stories, even if nobody else does. I’m working on a new series. I can’t say much about it, because it’s still in the early stages, but it’s big and it’s bold... and it’s not horror, even though in its own way it’s the darkest thing I’ve ever worked on. After learning the dark secrets hidden in Mr. Dowling's twisted mind, B is on the run. She escapes the clown's clutches and weaves her way through London's abandoned Underground, only to find that Mr. Dowling has laid siege to the Angels' base in County Hall. And when B learns of the history between Mr. Dowling and someone she trusted, she realizes that she can't rely on anyone--B, and B alone, is the only one who can save humanity. 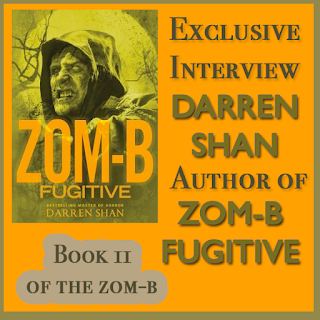 Darren Shan is the number-one bestselling author of the twelve book series Cirque du Freak, the Demonata and The Saga of Larten Crepsley, as well as the stand-alone books, The Thin Executioner and Koyasan. For adults he has written Procession of the Dead, Hell's Horizon and City of the Snakes, collectively know as The City Trilogy, as well as his latest, Lady of the Shades. Shan's books are sold in every continent, in thirty-one languages, and have been bestsellers in countries including America, Britain, Ireland, the Netherlands, Norway, Hungary, Japan, Taiwan and the UAE. In total they have sold over twenty five million copies worldwide. 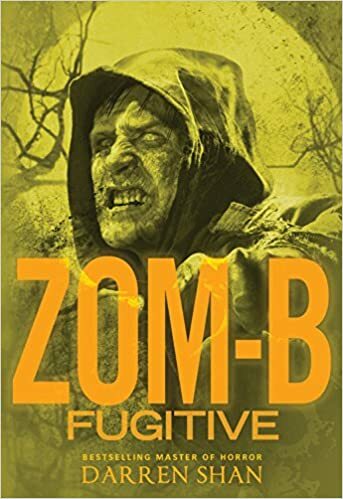 Have you had a chance to read ZOM-B FUGITIVE yet? Have you read any of the other books in the Zom-B series? Do you appreciate the worth of you stories?